The reverse T3 test measures the reverse T3 blood level. Reverse T3 lab testing is done to evaluate inactive triiodothyronine. What is a reverse T3 test? A reverse T3 test measures the reverse T3 blood level. Why is a reverse T3 test important? Reverse T3 is an inactive variant of T3 that is sometimes elevated when the body is under stress. This Reverse T3 Test is a blood test. The reverse T3 test, sometimes known as a reverse T3 lab test, T3 reverse blood test, rT3 test or reverse triiodothyronine test, measures the reverse T3 blood level. Reverse T3 (rT3) is a less common form of T3, a hormone produced by the thyroid gland. An inactive variant of T3, reverse T3 levels are increased when the body is under stress or during periods of illness or malnutrition. T3 reverse levels may also be increased in conditions such as sick euthyroid syndrome and some studies suggest that rT3 may be related to abnormal weight gain. Reverse T3 is a hormone produced from the metabolism of T4, or thyroxine, which is why it is sometimes ordered along with the total T4 test. There is some controversy within the medical community as to whether reverse T3 is of value as an adjunct to standard hypothyroidism testing. In particular, many functional medicine practitioners believe that elevated reverse T3 levels result from chronic stress in the body and, consequently, on the thyroid gland. In these situations, an elevated reverse T3 level may represent a form of hypothyroidism that is not identifiable by T4 or TSH testing, particularly when symptoms are present. The T3 reverse test can be performed with a simple blood draw at a Quest Diagnostics lab near you. Once your T3 lab report is available, it can be downloaded. 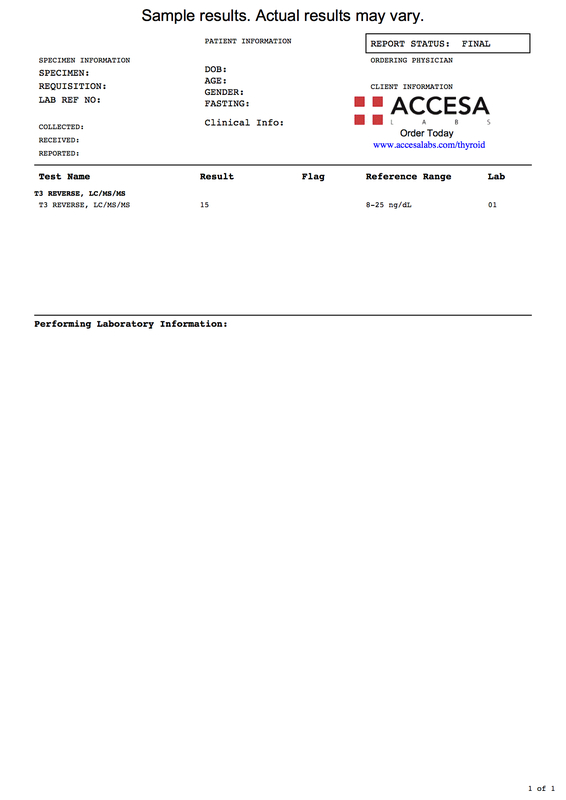 As can be seen on the sample reverse T3 lab report, the results will be reported as a number and can be compared against the reference range provided by the lab. The reverse T3 blood test is part of the more detailed comprehensive thyroid panel. Reverse T3 Test at Guaranteed Prices.